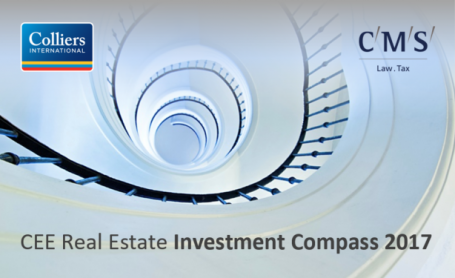 The Czech Republic received almost two-thirds of the total real estate investment in Central and Eastern Europe based on the preliminary Q1 2017 figures, according to the CEE Real Estate Investment Compass 2017 report compiled by Colliers International and CMS. The preliminary Q1 2017 data also suggests that 2016’s record-breaking total of EUR 12.2bn of investment flowing into the CEE region’s real estate markets will be surpassed in 2017. The CEE Real Estate Investment Compass 2017 examines key trends in the real estate markets of six of the region’s countries (Bulgaria, Czech Republic, Hungary, Poland, Slovakia and Romania) over the last five years, and takes a look at what is on the horizon for 2017. In the first quarter of 2017, preliminary real estate investment in the CEE-6 markets stood at EUR 2.3bn, representing a 41% increase compared from Q1 2016. The region has started the year well. Of that, the Czech Republic received 62% of the total real estate investment in CEE during the period at EUR 1.426bn. “The growing maturity of the CEE region may help combat the specific risks affecting Western Europe, that of ‘Brexit’ and its reverberations, which may unfold further in 2017. Brexit’s full consequences are not yet known and some might even end up as a positive for CEE,” says Mark Robinson, senior researcher, CEE, Colliers. The report identified a marked shift in the origin of flows to CEE in 2016 compared to previous periods in this cycle. South Africa, Asia and flows from domestic/CEE sources are now larger than those from G10 countries. Preliminary indications from Q1 2017 suggest continued significant local investor activity in Hungary and the Czech Republic, as well as the entry of Thai investors into Hungary and Poland. This continues what has been a striking feature of the CEE markets between 2011 and 2016, which is the rise of domestic and CEE cross-border flows, up from EUR 1.1bn combined in 2011 to EUR 2.6bn in 2016 – a strong sign of maturity in the region. The Slovak and Czech markets were both the largest origins and destinations of CEE cross-border flows in 2011-16, more than doubling in the period, while Hungary’s domestic flows have grown most rapidly in the recent period. “The further distance we get from 1989, the more developed the CEE markets become and the less reliant on outside investors we are. This can be observed not only in the real estate sector, but in the whole M&A market,” says Wojciech Koczara, partner at CMS. “The spread of Warranty & Indemnity insurance across the CEE markets is another sign of growing maturity in the region as well as the increased level of sophistication in the structuring of large real estate deals”. Looking at trends in 2017 in the CEE region, increased returns via lower yields are predicted in Budapest and Bucharest (all 3 segments of real estate market: Office, Retail and Industrial), and in Prague (Office and Industrial), while in Bratislava (all sectors), Warsaw (Industrial and Retail) and Sofia (Office and Industrial) a similar market situation is expected. Looking at the various segments, the share of Office transactions in the CEE Investment pie has remained broadly steady around the 40% mark (39% in 2016), while the absolute value of transactions has of course grown. The most impressive increases seen in the last year were in the Czech Republic (EUR 1.7bn in 2016 versus EUR 556m in 2015) and Hungary (EUR 939m versus EUR 291m). As the most liquid investment asset class, Office yields have compressed along with funding rates in this cycle, and the authors of the report foresee some chance of further yield compression in prime Prague, Budapest and Bucharest given the investment demand and rent growth dynamics. CEE Retail has been a clear story of firming rental dynamics, mostly because out of all the key real estate sectors it has the clearest positive link to consumer demand and wage growth. More money in the pockets of employed consumers, including many benefiting from significant hikes in the minimum wage in the likes of Hungary (30% over 2 years), Romania (16%) and the Czech Republic (11% in 2017), will translate into higher spending on both staples and discretionary goods. In the Czech Republic specifically, the probable appreciation of the Czech Koruna after the “currency cap” was removed by the central bank at the beginning of April 2017 will increase the purchasing power of Czech consumers further. The CEE Industrial sector is also booming, with a bright start to 2017 already recorded in official economic figures. For both manufacturing and logistics, wage pressures are the main macro risk to consider in the near term, with data from the quarterly industrial sentiment surveys collected by the European Commission suggesting that 33% of Czech companies and 22% of Slovak companies seeing a shortage of labour as a constriction on expanding production. The highest ratio in the region was Hungary at more than 75%.